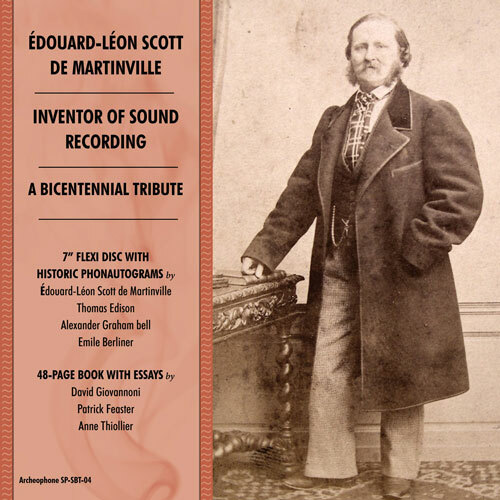 Edouard-Léon Scott de Martinville (1817–1879) invented sound recording twenty years before Thomas Edison re-invented it. But his phonautograph is only one of his many accomplishments. Here the partners of First Sounds—the team that played back an 1860 recording of “Au Clair de la Lune” in 2008 and brought Scott’s achievement to the attention of the world—tell his story in depth. David Giovannoni recounts Scott’s invention and development of sound recording; Patrick Feaster details Scott’s role as the father of sound technology; and noted French author Anne Thiollier offers the first modern biography of Scott, based on family papers. All three essays celebrate Scott’s scientific and literary achievements at the bicentennial of his birth. 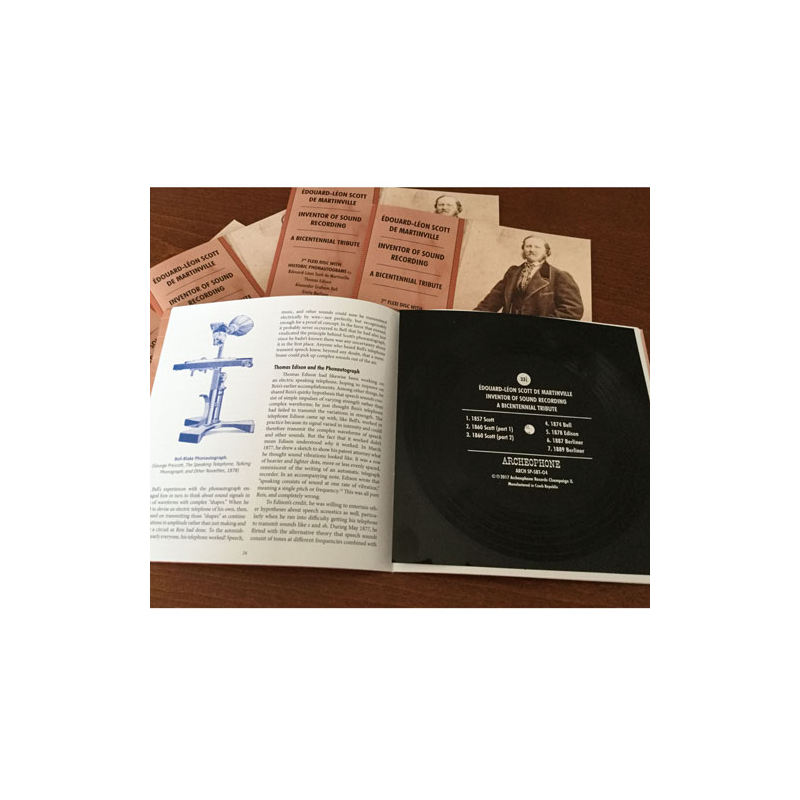 The 48 page, 7 1/4 square booklet includes previously unpublished photos of Scott and rare illustrations of early recording technology. 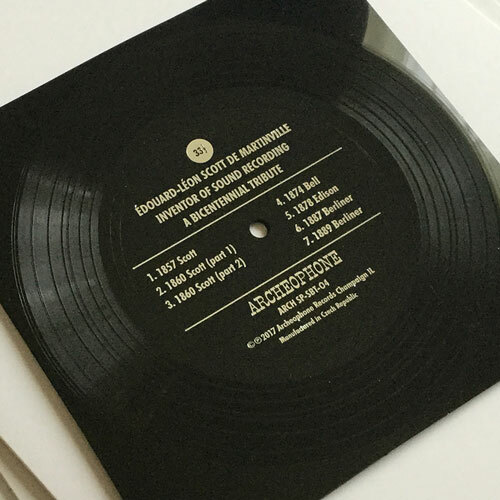 The enclosed 33-1/3 rpm flexi disc presents several of Scott’s recordings made in 1857 and 1860. Also featured are some of the earliest recordings made in the U.S. by Alexander Graham Bell, Thomas Edison, and Emile Berliner on experimental devices influenced by Scott’s phonautograph. The book includes a link to stream or download the audio as well. On April 29, 2017 a symposium was held at the Edison National Historical Park on the origins of recorded sound. Visit this link to view the virtual exhibit and video from the event. Read Jody Rosen’s New York Times cover story on the discovery, recovery and playback of the world’s oldest recording of the human voice. The discovery was led by the team behind this release: David Giovannoni, Patrick Feaster, and Archeophone’s Richard Martin and Meagan Hennessey.